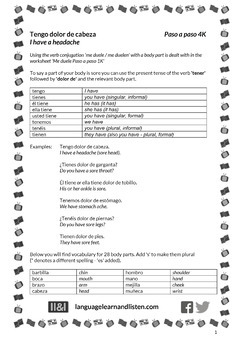 In this worksheet you will learn how to say that a body part is sore or hurts using the construction 'tener dolor de', for all parts of the verb, along with 28 body parts. There are 2 exercises (Spanish to English and English to Spanish) and all necessary vocabulary is provided. Suitable for all levels of ability. Answers provided.